Gold has many uses, including jewellery, electronics, and investment, the key reason it checks out as a positive for functional purpose in our safe-haven framework. Nearly 40% of gold demand is related to investment purposes, including bars and coins, central bank purchases, and exchange-traded funds. Theoretically, this portion of demand could be under threat to be displaced by cryptocurrency. Accounting for more than 50%, jewellery is the single-largest individual source of demand, shown in Exhibit 10 by country. After a 21% drop in demand in 2016 amid challenges in its two largest markets, China and India, 2017 demand stabilised in China while India returned to growth. This helped global jewellery demand recover 13% to 2,214 tonnes in 2017. Nevertheless, this remains about 400 tonnes below the average from 2013 to 2015. Our long-term thesis is unchanged, as we believe rising incomes in the two countries will lead to growing jewellery demand. As it is anchored by a religious and cultural significance not seen in Western countries, we see little reason to believe that Chinese and Indian interest in gold will wane anytime soon. 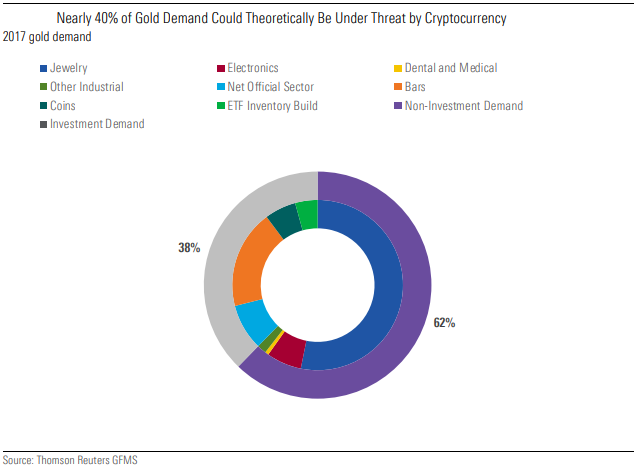 Other non-investment purposes for gold include electronics, dentistry, and other industrial uses. Gold has many attractive properties for use in these end markets. However, its high cost can encourage switching to alternative materials. We anticipate a slow secular decline to continue as cheaper alternatives steal share from gold. Although individuals buying bars, coins, and ETFs constitute the majority of gold investing, central bank purchases accounted for nearly 10% of total gold demand in 2017. As explained by Carl-Ludwig Thiele, member of the executive board of Germany's Bundesbank, "The availability of reserve assets like gold strengthens public confidence in the stability of a central bank's balance sheet." In other words, holdings in gold and other currencies can build confidence in fiat currency that otherwise has no backing. This may be particularly helpful for currencies that are facing concerns about the issuing government's economy. For example, Russia has been a significant gold buyer for its central bank in the past several years as its economy slowed. The public confidence gold lends to central bank balance sheets reflects the same reasons individuals invest in gold. We've classified individual gold investment into three major reasons, centred on its use as a store of value: inflation hedge, US dollar hedge, and safe haven. To assess gold's ability to hedge against inflation, we've looked at how gold prices have trended against inflation. At first glance, it may appear that gold is a mediocre hedge to inflation, as gold prices looked largely unmoved before the financial crisis in 2008. Looking solely at inflation ignores the opportunity cost of holding gold. When compared with another safe-haven asset like US Treasuries, gold yields no return whereas a government bond will pay interest. If we look at inflation less the US 10-year Treasury yield against gold prices and see a stronger relationship. When inflation minus the opportunity cost approached and even surpassed zero, gold prices rose sharply. This validates gold as a decent hedge to inflation, as long as opportunity costs are taken into account. 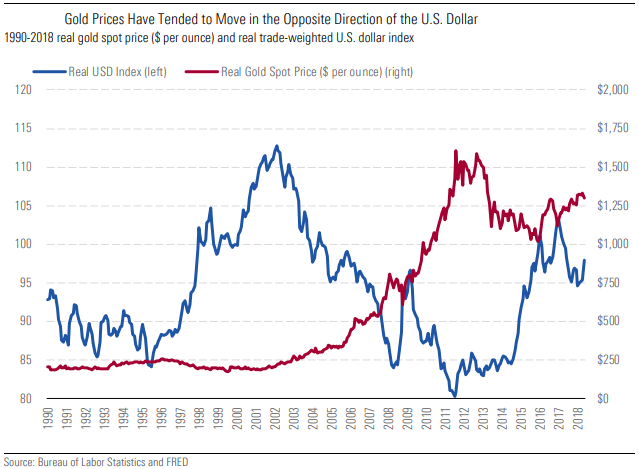 To assess gold's ability to hedge against the US dollar, we've looked at how gold prices have trended against the real trade-weighted US dollar index. During the massive drop in the value of the US dollar from 2002 to 2011, real gold prices rose more than 600% from $250 per ounce to $1,500 per ounce. Similarly, a rise in the value of the US dollar after 2011 saw real gold prices drop more than 30% to almost $1,000 per ounce. Given the apparent negative correlation, gold appears to be a decent hedge to the US dollar. Lastly, we've assessed gold's viability as a safe haven. We define safe-haven assets by their ability to hold, or even increase, in value during periods of trouble or uncertainty. First, we've looked at how gold prices have trended against the US economy. Looking at the changes in the real gold price and real GDP growth quarter over quarter since 1990, we see that changes in the gold price hold a weak relationship to US GDP growth. We believe this provides evidence that gold is a decent hedge to US economic cycles. Next, we've looked at how gold prices have trended against equity markets. Looking at the changes in the gold price and S&P 500 quarter over quarter since 2000, we believe the gold price's weak relationship to the S&P 500 provides evidence that gold is a decent hedge to equity markets. We determine cryptocurrencies to have poor viability as a safe-haven asset. We established that gold's functional purposes, including for investment purposes that include safe-haven viability, should be sustainable in the long run. However, in the near term, we expect investment demand for gold to fade as rising interest rates increase opportunity costs. In the vacuum left by retreating investment dollars, we forecast growing demand from jewellery to more than fill the gap over the next few years. China and India, already the two largest gold markets by far, should only see increased demand as incomes rise. 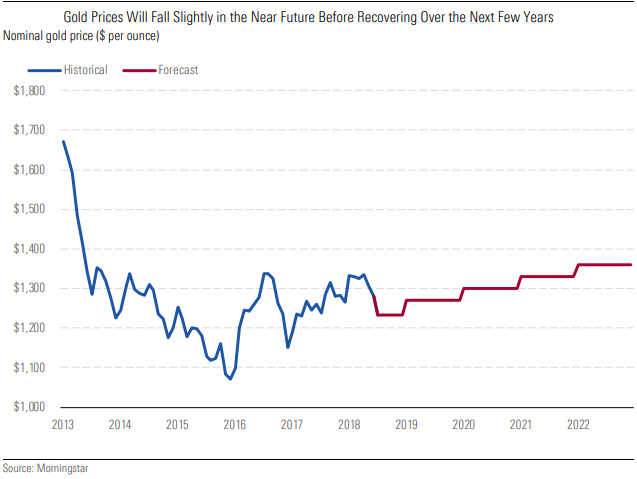 We forecast gold prices to decline slightly in the near term before recovering to $1,300 by 2020. Is Bitcoin Better than Gold as Investors' Safe Haven?